With thanks to Patchwork Press for the eBook galley copy of this novel! As always, my reviews are non-bias and fair. In the future dystopian society of Cabal, the government instills equality for all and offers its citizens the perfect system. There is food, shelter and jobs for everyone. The one requirement is to follow the rules without question, including the government's match in marriage and "The Day of the Chosen", a lottery that randomly selects families to conceive children as natural means hasn't existed in generations. Following her eighteenth birthday, Olivia Parker accepts her requirement to marry her childhood best friend, Joshua Warren, and is eager to start her work assignment and new life when it all comes abruptly to an end as she's arrested and thrown in prison. Unique dystopian premises always catch my eye and Aberrant sounded like mix between The Hunger Games and maybe with a dash of Divergent in there somewhere with the whole "perfect system" element, so I was super eager to read this. The world that Ruth Silver created in Aberrant had me hooked instantly. The beginning was a very light and steady introduction to the dystopian world, the characters; Olivia; the main character and Joshua; her childhood best friend and future "match" to be married to when she turned eighteen. But unknown to her, Olivia isn't like the others and is quickly thrown in jail for being brought into the world differently to everyone else and not from the Day of the Chosen. Joshua soon helps her escape and together they go on the run for answers and seek refuge in a new beginning together. The rules in each town, like Haven and Cabal alike, are very different. So when Olivia and Joshua reach the town of Haven, the system is quite different to get used to and to stay, they have to adapt to this new way. 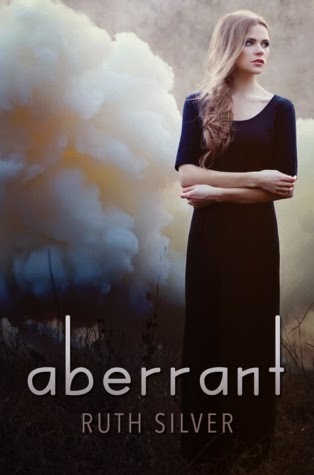 But they are forced to stay knowing that the government is plotting to destroy her and then her secret and Olivia will be gone forever, so you'll see just why Aberrant is so addictive once you know how these surprising elements keep creeping up and mixing up the appeal with every new unveiling. I can't imagine living in a world where everything is selected for me; like absolutely everything--things that make us individuals. It was believable and unpredictable, fast-paced and enthralling in addition. There was strength in the core of the plot, with it's captivating premise and overall package of promise and connectivity to the characters was great, too. Olivia was the main character in Aberrant, and although the story is very much about her and how this secret of who she truly is being released into the public knowledge, I couldn't connect with her fully. I was still mesmerized by the plot and it's structure, and although Olivia was a perplex and interesting character, on a level of 1 to 10 I probably connected with her around a 6, which is still understanding her to some level. Nevertheless, her and Joshua were a great team of characters that I felt is quite rare to read of in a book. Overall, Aberrant is a quick-paced and surprising novel for fans of all the best Dystopia out there at the moment, including Ally Condie and Suzanne Collins. I was very impressed and loved reading Aberrant. It was one of those books that is just really easy to get into and leaves you with a feeling that you've read an amazing story at the end. Thank you so much for taking the time to read and review Aberrant.